Organizing the home for children with special needs. Setting up spaces in the house for safety and efficiency is simple, and the results produce immense benefits. For children with special needs, homes should have a visual flow, be free of extraneous distractions and clutter, and offer clear choices. You will find the environment dictates functional behavior when spaces are deliberately planned at home. Eating areas should have a table that is the appropriate height for children to sit with their feet on the ground. A small table with accompanying chairs are perfect for kids to enjoy snacks and quick meals. For family meals at the main kitchen table, offer a bench to go under children’s feet, allowing bodies to feel organized and offering good posture for eating, chatting and socializing. Food preparation areas should have a stool for children to climb up on for helping with meal preparation. Perhaps invite kids to spin and tear the lettuce, place it in a bowl and toss in some small tomatoes. Consider encouraging children to put a handful of breadsticks in a basket to carry to the table. Offering kitchen helpers opportunities creates a sense of family participation and personal value. It’s also a great chance to model language, reinforce family values like teamwork and provide practice for increased attention with caregivers. For pre-verbal children, affixing pictures of food choices on the refrigerator is a great way to link language to requesting preferred food choices. Velcro or magnets are excellent for this. Children won’t needlessly become frustrated or rummage to find what they want. Instead, kids can be taught to hand the pictures to you to indicate something like, “I want this please.” Use that golden moment to state, “Oh, you are telling me (pause) ‘Mommy, I want applesauce.’” Then wait for some paired vocalization from your child before delivering the food. Even if it’s just an approximation, keep practicing to shape the sound to eventually sound more like the accurate word. Establishing kitchen-related chores is a great way to teach household responsibility. If children have the ability to match similar items, a chore can be to put the clean utensils in a drawer. Another idea for a chore is to cut out the label of a finished food item, glue it to a grocery list or copy the label onto the list so the item can be found in the supermarket on your next shopping trip. Keep toys in bins with lids in a closed closet. Rotate toys that are thematically related and only display a minimal amount at one time. You might have wooden blocks with cars and trucks available at a certain time. Maybe a toy garage could be taken out to go with that. Model the function of the toys and the sounds you can make with them, as well as the nouns, verbs and adjectives that correspond with them. After a week or two, put away the toys that are out and take out another set such as the pretend cooking utensils and food. Repeat the modeling. You will find that your children’s play is more focused when the language is consistent, the clutter is removed and the theme is reinforced throughout the house. This prevents children from getting tired of seeing the same toy. In addition, as kids develop, new and more mature themes arise when you revisit toys that have been in the closet for a while. Again for pre-verbal children, provide pictures of the toys. You can cut out photos from the box or print them from Google Images, for example. This way kids can make choices and express them by handing you the pictures of what they desire. Use such moments to model the language you hope to soon hear. Follow the same format as above. Clear the space, organize materials into bins, provide pictures as visual models and model the behavior you wish to see in each space. Even pictures of clothing on drawers can assist children with things such as getting dressed and putting away their folded laundry as they match what’s in the pile to the visuals on the drawers. Color code as needed. Perhaps all kitchen toys are in red bins while all vehicles are in blue and so forth. 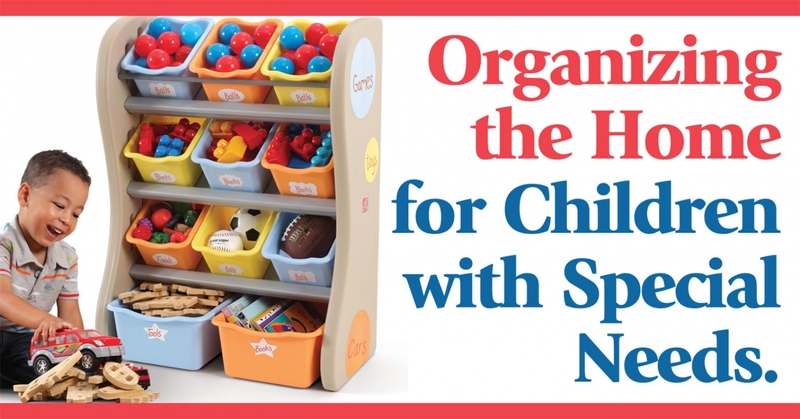 Visual learners connect to this and can find and use toys more efficiently when there’s order in the house. Remember that in every room, safety comes first. Use cabinet locks, child-proof drawer latches and take other safety measures to avoid dangerous situations. They can be removed once your child demonstrates safe behavior. About the author Susan Varsames, M.Ed. Susan Varsames, M.Ed., has been teaching and consulting in special education for more than three decades. She is the owner/founder of the Holistic Learning Center, LLC, in New York, where families can access both traditional services and alternative practices for both children and adults.